This article was originally published on August 24, 2017 on The Duran. This century alone has borne witness to former Warsaw Pact members Estonia, Latvia and Lithuania not only joining the European Union, but also NATO – an imperial branch of the United States with aggressive, expansionist ideals. The Baltic States are situated on or nearby Russia’s border, and are currently home to hundreds of US and NATO troops stationed there as a “deterrence” against what is perceived as “increased Russian aggression”. It is difficult to know whether to laugh or cry at the recklessness of such policies, as these nations’ leaders willingly endanger the safety of their own citizens. Not to mention throwing away any chance of sovereignty or independence by opening their borders to Western imperial power – welcoming American, British, German soldiers, and so on, and exposing their populations to neoliberal globalisation in the shape of the IMF. What the Baltic leaders, and others, should be doing is engaging in constructive dialogue with Russia that would be of far greater benefit to the security and wellbeing of their people. Instead it is one case after another of jumping aboard the gravy train as the money rolls in from the West, and into the hands of elite power while populations are cut adrift. Meanwhile, relations across the border continue sinking to dangerous lows as virulently anti-Russian messages are widely expressed. “USA is indispensable to ensuring the security of our immediate neighbourhood, as well as all of Europe”. Security for “all of Europe” from what one can only speculate in bewilderment. Security from the US would seem more appropriate judging by the superpower’s “indispensable” record in previous decades. Unfortunately for Ratas, Lithuania have already won the race for deployment of US Patriot missiles – with the “sophisticated missile defence system” having been erected there over a month ago. “The speed of response to an airborne threat may be crucial. Therefore, it would be appropriate to have such weapons in the Baltic region”. An “airborne threat” from where one can again but guess. The insanity behind these actions shows no sign of abating. Increasing militarisation of this area is leading to a rising threat of collisions and other incidents that could escalate into something much more serious. In June for example, a US reconnaissance plane and a Russian fighter jet came within several feet of colliding over the Baltic Sea. What would the reaction have been if the aircraft had collided? Naturally the incident was framed as an example of “Russian aggression”, with few querying why an American reconnaissance plane was operating thousands of miles from Washington, and so close to Russian territory. Russia, and China for that matter, are acutely aware that US missile “defence” systems are in reality attack systems – a first strike weapon designed to establish strategic superiority and exemption from retaliation. What’s more, these aggressive actions are aimed at a country (Russia) that has been repeatedly invaded over the past two centuries – by Napoleon and Hitler to name two. Judging by Western commentary, Russian President Vladimir Putin has no right to be concerned about such hostile operations. Instead the blame is put on “Russian incitement” when in reality the incitement is coming from elsewhere – a neutral observer could not help but notice the vast hypocrisy and deceitfulness at work here. Russia, if anything, have been remarkably tolerant in the face of ongoing provocations. “The West had been moving into Russia’s backyard and threatening its core strategic interests, a point Putin made emphatically and repeatedly. Elites in the US and Europe have been blindsided by events only because they subscribe to a flawed view of international politics”. A very flawed view it seems, but not that such sensible arguments are ever relayed to the Western public by the corporate media. 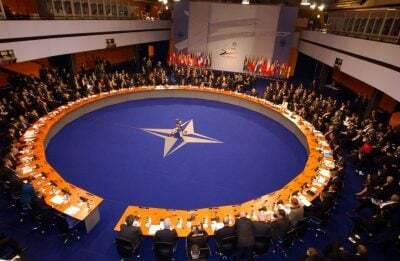 One of the key reasons for NATO’s existence was outlined by its then Secretary-General Jaap De Hoop Scheffer in 2007, that “NATO troops have to guard pipelines that transport oil and gas that is directed for the West”. NATO is present to benefit elite Western power along with puppet leaders who, one can assume, are not left out in the cold [Ratas, Grybauskaite, etc]. Nor is the crisis limited to the Baltic states. Earlier this year four thousand US troops arrived in Poland, along with 250 tanks, the largest such deployment since the end of the Cold War. This has prompted outrage from Russia at such haphazard manoeuvres – which will lead to “US troops [being] permanently stationed along Russia’s western border for the first time”. “Today I am certain we will not be in danger”. Poland – another former Warsaw Pact member – joined NATO in 1999, before becoming part of the EU five years later. Last month it was reported there are about 45,000 US and NATO troops throughout the European mainland – from Bulgaria in the south, northwards to Romania, through Slovakia and up to the Baltics. They are “staging war rehearsals for a Russian invasion”. In 1951, NATO’s then supreme commander General Dwight D. Eisenhower wrote that “this whole project [NATO] will have failed” if US soldiers had not been withdrawn from Europe within 10 years. It has long become clear why it has failed.